If you’re going to live off of your talent and skills you better make sure they’re always up-to-date and current on industry trends. Education is important to better yourself and your work. Luckily you don’t have to spend a dime to do it and there’s always options to learn, even when you don’t have time. 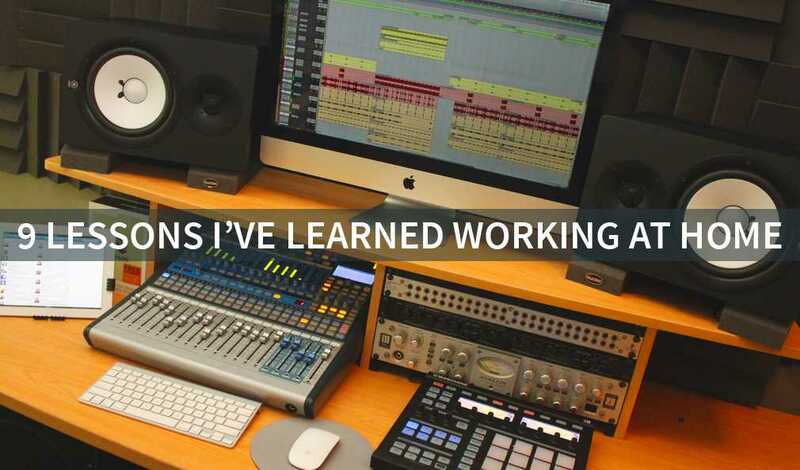 When I started building my first recording studio I learned a very expensive lesson. Buy cheap, buy twice. This doesn’t mean you have to buy the most expensive things, but you should go after the best tool for the job – whether it’s free or expensive. Compromising hurts your business in functionality and appearance. Whether it’s budget microphones or $200 desktop computers you’ll want to stay away from this kind of garbage. Save and spend a bit more on things that will last and give a professional performance. In the past I’ve used PayPal invoices, which is useable and horrible looking solution, but using something like Pancake or Wave is amazing. This is the same reason why I invest in Macs over PCs. Custom-built PCs are great, but in my experience as a creative professional, Macs offer the better software and longevity in use. They seem expensive in price compassion, but the longevity balances out the price easily. You have to, have to, have to save money. There’s no way around it. Taxes are the devil, but you have to deal with them. It’s always important to keep track of your finances because as an entrepreneur you’re entitled to a hell of a lot of tax breaks. Business meetings, gas, 1/3 utilities – everything you do counts. Pay for Photoshop? That counts. Bought advertising? That counts too. Education? That too! Having your studio or office mere feet away makes you prone to working 24/7. I know it’s hard to resist working when you love your job so much, but it’s a necessity to interact with family and friends. It’ll help you keep a bit of sanity and relax your mind. It’ll also keep motivation to do better for them – not to mention show that you care taking time out of your dream job for them. I know being your own boss means you’re in charge of mostly everything. I personally don’t outsource much of anything, which is a control freak issue on my part. However if you’re finding yourself crunched with nothing but work it may be time to outsource a few tasks. On the opposite side of the spectrum, your family and friends sometimes don’t understand that because you work from home doesn’t mean you can drop what you’re doing whenever. Constant interference can not only screw up your schedule but your concentration on tasks. You need to establish boundaries! Simply set a loose schedule to stick by and fine-tune it as needed. Make it clear that you work around certain hours and that unless it’s important or a once-in-a-lifetime opportunity it will have to wait until later. You can give me any test you want and it’ll prove I’m a straight introvert. Large groups of people give me anxiety and it drains me – most times I rather avoid it. It’s ironic being an entrepreneur, but it’s a necessary evil in my life. While we can thankfully take advantage of modern tech to relieve stress – think of web chats, Skype, forums, etc. – physical networking is still necessary. The key is to find something you’re excited about. For example a high-profile guest speaker at a panel or something of the sorts alleviates the mental pressures. It’s easier to talk to someone with a commonality between each other. While I won’t go into too much detail since I’ve covered this in the past, I will say that your sanity is important. In addition to making room for others you need to make room for yourself, be comfortable, and regain your focus. Burn outs are no fun. I completely understand as an entrepreneur you feel like an unstoppable superhero. Just remember even Batman needs Robin and The Avengers all need each other. Don’t be afraid to reach out to other entrepreneurs for help in their areas of expertise. You can’t be the master of everything! Swap favors and network, it’s also a pretty good way to build a relationship. This is probably the most important piece of advice. Things get tough for everyone regardless if you’re working from home for yourself or in a Fortune 500 company in a fancy office. Business sometimes gets slow, there are roadblocks in projects, you mess up a deadline, you have to shell out a lot of money to fix something, personal issues are having effect on your work, etc. – these things happen in life! It is inevitable in life that something will go wrong at some point and you have to keep in mind that this is normal. Take a deep breathe and figure out how you’re going to jump the hurdle. Pick yourself up and examine your options. Just don’t ever give up on your dream – that’s the only option you should never take. What are some of your lessons you’ve learned working from home? Share your favorites in the comments below!